Tata Harper Resurfacing Mask Review (2019): Is It Safe To Use? 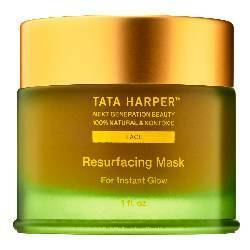 Tata Harper RESURFACING MASK, US $58 for 30 ml, is a face mask that peels off your skin’s damaged layer to reveal more youthful and more radiant new skin layer. Tata Harper is a skin care brand that puts health and beauty on the same pedestal, and which promises never to compromise one over the other. All Tata Harper products are rid of synthetic ingredients and formulated only with naturally grown, freshly harvested ingredients to go with every bottle of that it sells. The brand takes pride in growing its own ingredients and manufacturing it at the same time — the only way it can guarantee that its formulas are 100 per cent synthetic-free and all-natural, all the time. This product works by exfoliating your skin gently once up to several times weekly, depending on your skin’s tolerance, to prevent the aggregation of impurities on your skin. This product is formulated with 100 per cent natural ingredients, with 83 per cent of which coming from organic farming sources. This product is made with clinical grade essential oils blend. This product is relatively more expensive than products from other all-natural brands in the same category of skin care. The manufacturer fails to present any evidence of skin improvement claims made about this product. Based on this product’s composition, skin irritations and allergic reactions due to several ingredients, including fragrance ingredients, may be experienced. Tata Harper RESURFACING MASK is ideal for a mid-week amped up rejuvenating skin treatment to relieve tired skin of fatigued look, and boost the energy and moisture content of your skin, as well as clear it of impurities. Apply on freshly cleansed skin and leave on for no more than 5 minutes. Rinse with lukewarm water and immediately follow through with a moisturizer. Tata Harper RESURFACING MASK gives your skin an energy and moisture boost to help your skin survive the rest of the week in better health and condition. However, more damaged and aged skin types may need something more potent to give it a longer lasting relief from stressed and fatigued skin.